The NEW GC500 is a highly efficient unit. Durable, easy to operate, powerfully loud and extremely affordable, you can’t go wrong with this electronic game call. It’s perfect for beginners as well as more experienced hunters and can be used to activate an electronic decoy for greater attraction. This product features a 300-yard remote control range that doesn’t require line of sight. It can be easily programmed with up to 24 calls through a standard size SD card, and includes an auxiliary jack for extreme volume requirements, backlit screen, control buttons, and quality speakers that can play custom audio .mp3 and .wav files up to 16-bit rate. Great for attracting coyote, bobcat, fox, wolf, bear, crow, raccoon, whitetail deer, snow geese, wild turkey, and much more, The GC350 includes 24 pre-programmed calls from Wildlife Technologies to jumpstart your hunt as well as FREE call library access! Package includes (1) ICOtec GC350 - Programmable Remote Electronic Predator Game Call. Please note: Unit requires 4 AA batteries (not included). Remote comes standard with a 12 volt battery (included). Includes 1 year factory warranty. THE NEW GC350 - The NEW GC500 is a highly efficient unit. Durable, easy to operate, powerfully loud and extremely affordable, you can't go wrong with this electronic game call. It's perfect for beginners as well as more experienced hunters and can be used to activate an electronic decoy for greater attraction. LOADED WITH FEATURES - This product features a 300-yard remote control range that doesn't require line of sight. It can be easily programmed with up to 24 calls through a standard size SD card, and includes an auxiliary jack for extreme volume requirements, backlit screen, control buttons, and quality speakers that can play custom audio .mp3 and .wav files up to 16-bit rate. WORKS FOR A RANGE OF ANIMALS - Great for attracting coyote, bobcat, fox, wolf, bear, crow, raccoon, whitetail deer, snow geese, wild turkey, and much more, The GC350 includes 24 pre-programmed calls from Wildlife Technologies to jumpstart your hunt as well as FREE call library access! INCLUDES REMOTE - If you're a master of the hand call, take advantage of the remote range that doesn't require line-of-sight to stay better hidden from your game. The more advantages you have, the more results you are potentially going to see. 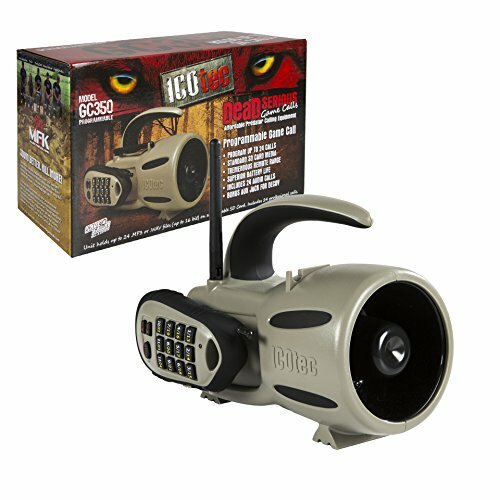 PRODUCT SPECIFICATIONS - Package includes (1) ICOtec GC350 - Programmable Remote Electronic Predator Game Call. Please note: Unit requires 4 AA batteries (not included). Remote comes standard with a 12 volt battery (included). Includes 1 year factory warranty. If you have any questions about this product by Icotec, contact us by completing and submitting the form below. If you are looking for a specif part number, please include it with your message.